Executive Mosaic’s GovCon Index traded lower Wednesday on sell-offs in its largest defense prime components as U.S. stocks also held modestly down with financial stocks and utilities among the most notable decliners. 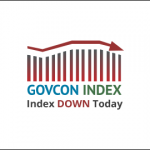 GovCon Index laggards outnumbered gainers by a 2-to-1 ratio and all 11 of its S&P 500 components fell with Lockheed Martin (NYSE: LMT) the biggest drag on the GCI overall and among co-listed companies. Seven GovCon Index-S&P 500 companies shed at least $1.00 and three tumbled by more than $2.00. Northrop was followed in the GCI’s lowest five net performers by Northrop Grumman (NYSE: NOC), General Dynamics (NYSE: GD), Boeing (NYSE: BA) and medical equipment supplier McKesson Corp. (NYSE: MCK). Large-cap defense primes drove the GovCon Index to four straight days of gains by at least 1-percent until Tuesday on investor anticipation of military spending increases in a Donald Trump administration. Advances by military shipbuilder Huntington Ingalls Industries (NYSE: HII) and government services contractor CACI International (NYSE: CACI) helped pare the GovCon Index’s decline despite the clear ratio of GCI components in favor of decliners. Since the Nov. 8 election, Huntington Ingalls’ stock has traded 15.92 percent higher and shares in CACI have added 14.59 percent. Technology shares helped lift the NASDAQ to a modest gain while the S&P 500 and Dow Jones Industrial Average posted modest declines as eight S&P sectors moved lower. Futures markets have the odds of a December interest rate hike at more than 90 percent and investors also looked at unchanged readings in the U.S. producer price index and industrial production for October, according to CNBC.